What’s a Manatee? 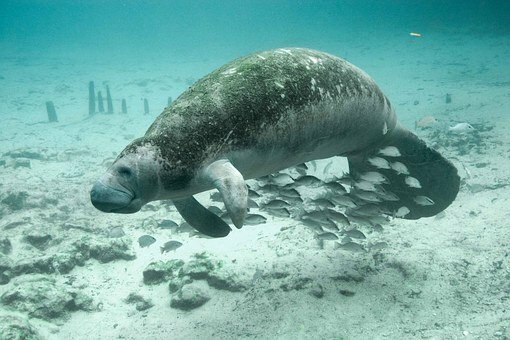 They are a large swimming mammal, which there are 4 types of Amazonian, West African, Antillean, and Florida Manatee. They are dark and wrinkly with hardly any hair. Their two little flippers on their upper body are utilised to help them eat and to steer when they swim. There are nails in their flippers to help them dig when looking for food. They are extremely unique creatures. It’s said that manatees were land dwelling animals and that about 50 million years ago they left land to the sea. They continue to breathe air, but slowly developed their bodies for life in the water. Although manatees are very large they are among the gentlest creatures. These beautiful animals are very much endangered. A whole lot of this is do to boating accidents, but there are quite a few other reasons for their falling numbers that are all mostly because of humans. Manatees may not be as amazing as mermaids but the gentle, fun loving mammals are amazing in their own right. It is said that Christopher Columbus claims to have seen mermaids in the Caribbean Sea on his way to the West Indies. Nevertheless he told his friends that these”mermaids” were not as beautiful as he’d seen in paintings. What he possibly saw were colonies of manatee. If you would take the opportunity to get to really know these magnificent animals you couldn’t help but fall in love with them as I have. There are lots of different avenues you can take if you would like to help save these magnificent animals. It is possible to adopt a manatee, donate to a charity, and help keep our waters clean are among some of them.